Nice and shredy with lots of channel chit chat. One thing though, Eric did not adjust his camera to isolate the guitar demo as much as I would have preferred. 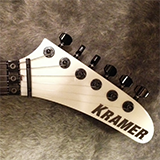 But hey, a Kramer getting some love is worth a look and listen in my books. More than 12 minutes before the first fiddle is unboxed? WTF . One thing that I will never understand is how in the name of all rock gods people think to be able to judge the quality of sound/tone of a guitar when the signal path is completely clogged with way too much distortion and any kind of modulation and reverb you can think of. For me that is the least helpful kind of review . Awesome. You just saved me 13 minutes of frustration. Thanks!!!! I laugh at the videos that are supposed to review guitars and the person playing is using tons of distortion, and sweep picking 64th note arpeggio's as fast as they can. Sounding like a retarded, drowning, turkey. It is JUG, JUG, WEEE! J-JUG, JUG WEEE! Yeah that's how to show us what a guitar sounds like. My only problem with this video is that Bob Ross didn't tell me where to put the happy little tree. Well it's a matter of preference :) I laugh at the guitar videos playing only like ten clean sounds and all the different switch/pot settings, which I never, ever use for anything. I prefer high-gain tests with common amps, but the stuff played should make sense and show what the guitar can/can't do.